An aerial view of the sprawling property. 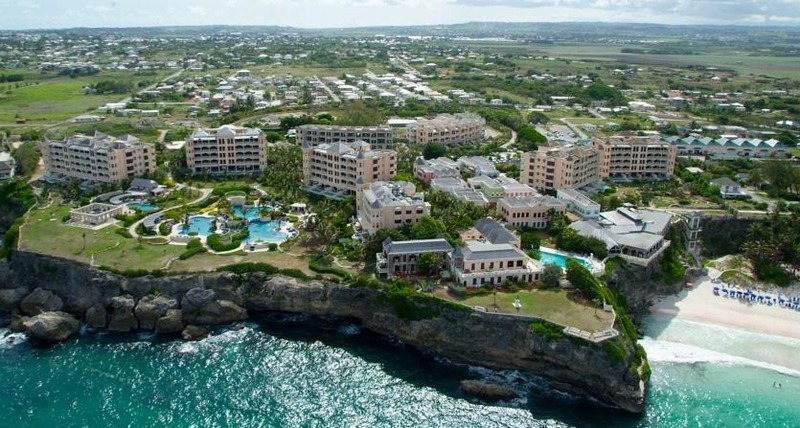 L ocated on famous Crane Beach and overlooking the ocean, this Barbados resort features five pools, including the iconic Historic Hotel pool which is set at the top of a cliff. Each 19th-century-style room at The Crane Residential Resort includes vaulted ceilings and a four-poster bed. They are equipped with cable TV, a DVD player, and free Wi-Fi. The marble bathroom is furnished with a whirlpool tub. Some rooms have private plunge pools. An art gallery and a shopping complex with clothing and jewelry stores are part of The Crane. Guests can work out on the cardio machines in the gym which offers views of the beautiful cascading pool. L’Azure Restaurant, located on-site, specializes in seafood and provides seating on its outdoor balcony. Zen Restaurant offers traditional Japanese and Thai cuisine, while The Carriage House is a poolside restaurant that serves light meals and cocktails in a casual atmosphere. Fly into Grantley Adams International Airport , Barbados (BGI). The Crane is 15 minutes from the airport. Visit The Crane’s website for more information.